I can understand if you think another story (short or not) about the Zombie Apocalypse is overkill. Like every other story idea, it's been done to death. What set this apart for me were the other elements. 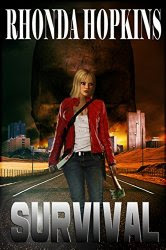 First, Sarah rescuing her twin, which is the main story conflict with the zombies just one more thing getting in the way of resolving that problem. Second, Sarah's relationship with her coworker Merideth and how that changes as they come to understand each other better. Not your typical zombie story at all. Rendered Invisible / Frank E. Dobson, Jr.